FRAMED PRINT. 22x18 inch (56x46cm) Framed Print with Black Satin with Off-White Digital Mat. 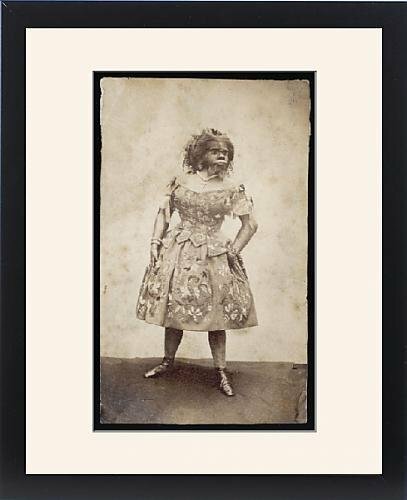 Artwork depicting Julia Pastrana from Mexico, hairy woman. Julia Pastrana, from Mexico, a hairy woman who married a showman, Theodor Lent, but died in childbirth at Moscow (the child also died). Her body was mummified for display purposes, but now resides in a sealed coffin at the University of Oslo, Norway. Professionally made to order in the USA. Artwork Description... Julia Pastrana, from Mexico, a hairy woman who married a showman, Theodor Lent, but died in childbirth at Moscow (the child also died). Her body was mummified for display purposes, but now resides in a sealed coffin at the University of Oslo, Norway.